Unearth the city of Whyalla. Explore trails and walks that will educate, enlighten and showcase the many facets and stories of Whyalla. In 2001, the city of Whyalla celebrated one hundred years since its establishment. 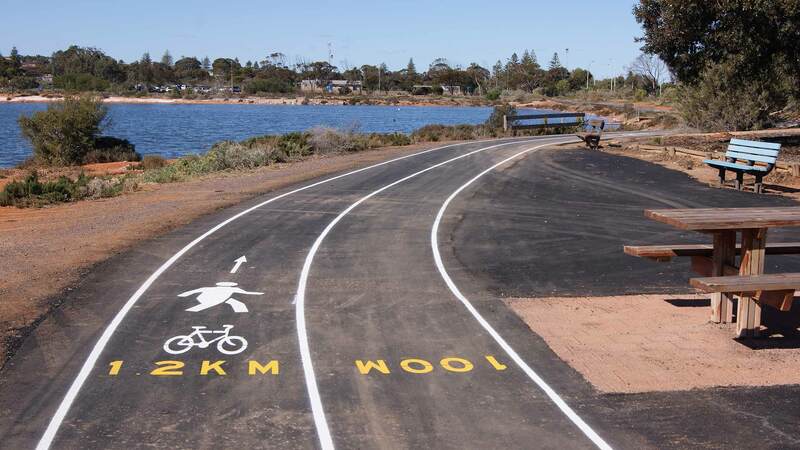 To commemorate this significant event and to promote the city’s unique history and environment, Whyalla City Council developed three heritage walking trails – the City Walk, Education and Cultural Walk, and the Wetlands Walk – jointly known as The Centenary Trailways Project. Before embarking on any of the trails, please ensure that you have enough drinking water and remember to use sun protection. This walk, at the north-eastern end of the city, encompasses many of the city’s historical sites including where some of the first buildings were located. Hummock Hill is included in the walk and the panoramic view of the city, Spencer Gulf and Flinders Ranges makes the climb to the top worthwhile. Whilst at the top of the hill you can examine the guns used to protect the township during WWII. Beginning and ending at the corner of Jamieson and Horwood Streets, the trail follows the OneSteel fence on the northern side of Hummock Hill to the top and then winds down to the CBD. Interpretive signs along the trail explain the history of the settlement, industrial history, natural and maritime heritage, and the city’s unique architecture. Length of the trail: 1.9km. Follow the red route markers. Warning – there is a steep incline on Hummock Hill and the trail merges with the road on the southern slope. The Education and Cultural walk is situated geographically in the centre of Whyalla and encompasses the main education and cultural precinct of the city including the campus of the University of SA, TAFE SA, Leisure Centre, Regional Development Australia and Middleback Art Centre. The trail starts and finishes at the Whyalla Leisure Centre. There are interpretive signs along the way providing interesting facts about the significance of the buildings and the area. Length of the trail: 2.1km. Follow the blue route markers. Wetlands Walk traverses the site of the Whyalla Wetlands. Part of this land originally incorporated the city’s first airport. Interpretive signage along the trail provide information about the city’s first airport, the city’s water management initiatives and a wealth of historical information. There are many indigenous and introduced plants to admire as you meander the pathway whilst listening to the local bird life. Length of the trail: 0.9 to 2.5km depending on where you walk. Fitzgerald Bay/Point Lowly hiking, cycling and driving trail. This twelve kilometre long heritage and nature trail, which starts alongside a tidal creek, hugs the coastline to Point Lowly. The trail covers 12km one-way and is divided into two sections - The Fitzgerald Bay Hiking Trail (4km) and the Fitzgerald Bay-Point Lowly hiking, cycling and driving trail (8km). The trail is named after early 19th century French navigator Louis Claude de Freycinet who led an exploration into the upper Spencer Gulf in January 1803, 10 months after Captain Matthew Flinders sailed along the Point Lowly coastline. The first section runs through dunes, pebble beaches and bushland before joining up with the joint use trail which follows the coastal emergency track, providing spectacular views of Spencer Gulf and the distant Southern Flinders Ranges. Interpretive signs explain the Aboriginal history, early European exploration, flora and fauna, marine life and contemporary use of modern technology in the area. You’ll also see unusual and geologically significant pebble dunes along sections of the coastline. These are naturally occurring shingle beach ridges which were formed about 7000 years ago and are the only ones in SA. Always carry enough water and use sun protection while on the trail. Geocaching is a real-world outdoor treasure-hunting game. Players try to locate hidden containers – “caches”- using a GPS device or GPS- enabled smart phone, then share their experiences online. There are literally hundreds of geocaches located in and around Whyalla and the Point Lowly area, so why not be adventurous and enjoy this fun activity when enjoying the region. Sign up for free to the geocaching.com website, so you can search for and obtain the cache details. It’s a great excuse to get off the beaten track and explore parts of the country many travellers would never see. Walk, bike or drive to a nearby hidden cache and enjoy the thrill of the hunt.